An empanada is a type of pastry baked or fried in Hispanic cultures. The name comes from the Spanish verb empanar, and literally translates as "enbreaded", that is, wrapped or coated in bread. 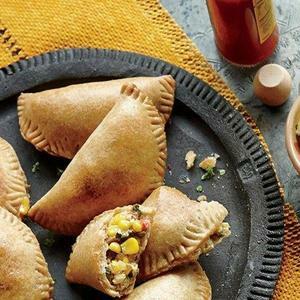 Empanadas are made by folding dough over a stuffing, which may consist of meat, cheese, corn, or other ingredients.